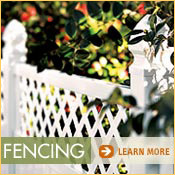 Build Backyard fun on your own! You can make your kids happy with things that swing. It's easy with our playset kits. You can also easily tailor the kits to fit your family's needs and budget by adding whatever accessories you wish. 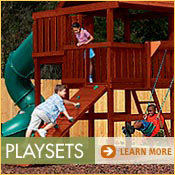 We offer the safest, most reliable playsets you'll find. Choose a kit that offers the basic components and size you need...then customize your set, or update it later, with exciting optional accessories (sold individually). Playsets are portable too – if you move, take it with you! Two towers mean twice the forts, twice the slides and twice the fun. Plus, kids with different skill levels can play all at once. Four design options to fit your family – from clubhouse to Turbo Tube Slide. Includes two triangle brackets, 16 step brackets, screws and all the necessary hardware. 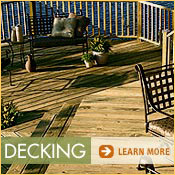 Lumber, slides, climbing rock, canopies and child swings sold separately. Who doesn't want to go for a ride with Clifford? This joyous swing, for ages nine months to three years, comes equipped with safety harness, rope and pelican hooks for hanging. 55 lb weight capacity. Swing hangers sold separately. Internet/catalog only. They will scale new heights as they test their strength by scampering up this rugged, black nylon rope climber. All hardware required for securing rigging is included, along with illustrated instructions. Internet/catalog only. Give your kids mountains of fun and a safe way to improve their climbing skills, too. Each kit includes four professional-grade rock-shaped holds of sturdy plastic resin, all the hardware needed for securing them, plus illustrated step-by-step instructions. Designed for children ages five and up: 230 lb weight capacity. Lumber sold separately. Internet/catalog only. It's a tunnel that leads to all sorts of adventures, yet also has a very practical side – it keeps the slide cool and out of direct sunlight. Colorful, UV-treated nylon cover has see-through mesh panels for safety. Attaches easily to most wooden swing sets and fits slides 8' and larger. Several styles to choose from. Internet/catalog only. Kids can swing it alone or invite a friend to really soar. Smooth molded plastic hangs by an "ouchless" chain. 200 lb. weight capacity. Mounts easily (lumber required, not included) with the included hardware. Internet/catalog only.